Hello and Happy Valentine’s Day to all! It’s been my experience that some people have a personal love and affinity to the celebration of Valentine’s Day while others I’ve known have loathed and despised it. I think it might be safe to say that whether you love or hate this national holiday of love, nothing can take away from the personal touch and expression of affection as giving someone something handmade. 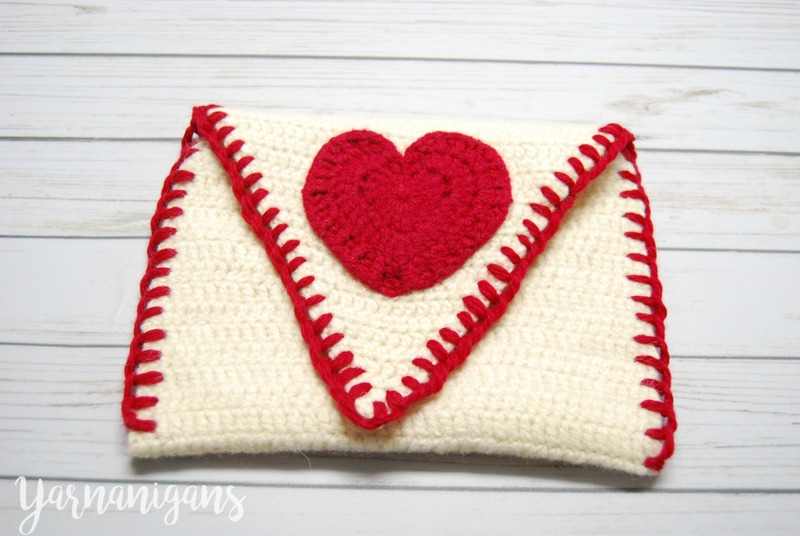 Those that hate it might not have had any reason to celebrate it prior, but the gift of this Valentine’s Pouch with a handwritten Valentine’s card might be just what they need to know they are loved and warm their heart. 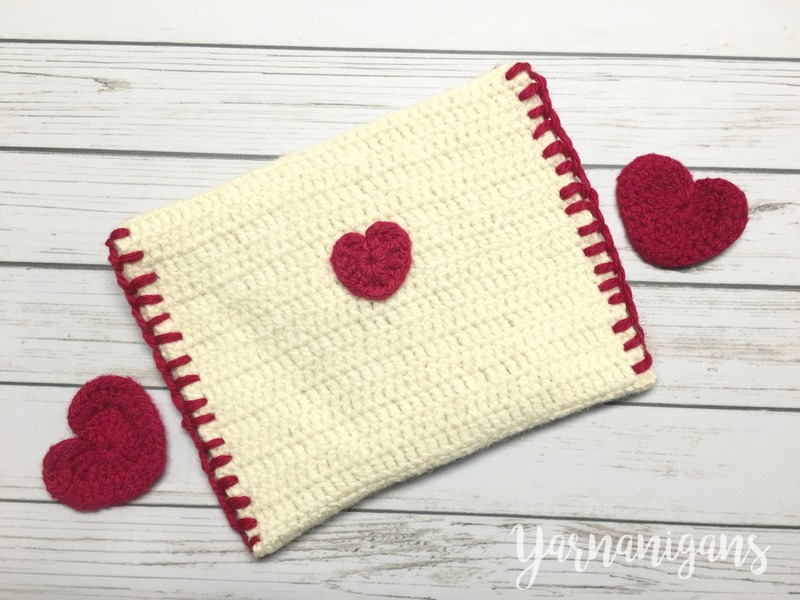 This felted Valentine’s pouch would be perfect for carrying home all those wonderful valentine’s cards and candy that children receive at school, or it could envelope a card or gift for your lovely guy or gal this holiday. Fill it with anything your heart desires and it will be sure to put a smile on the face of any recipient! If you’ve never felted before, don’t be intimidated to try it – I guarantee it’s not as hard as it seems! Enjoy this easy pattern and tutorial to make your own felted pouch. hdc2tog – yarn over, insert hook in next stitch, pull up a loop, yarn over, insert hook into next stitch, yarn over and pull through all loops on the hook. You have now decreased 2 stitches into 1. The pattern is simple to follow. You’ll first crochet the pouch, then go through the process of felting it (if you choose to do so. The pattern would be just as nice if you choose not to felt it). 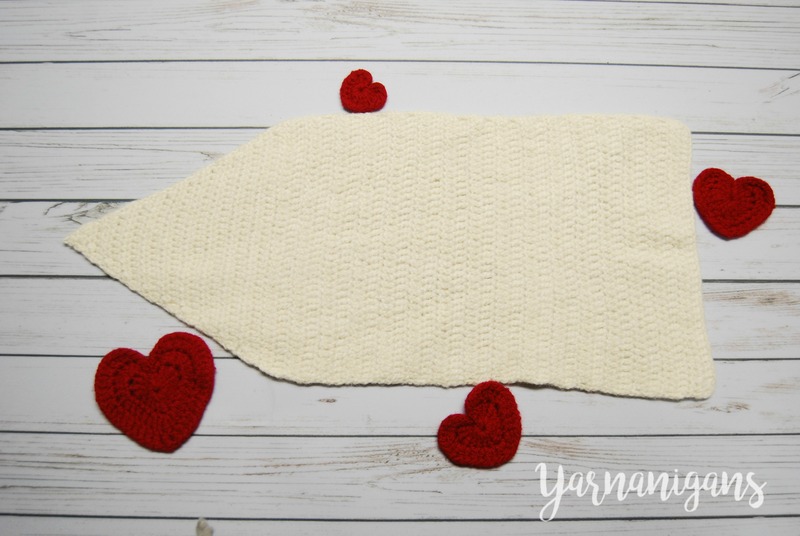 Once felted and dried, you’ll attach your felted crochet hearts, then seam up the sides of the pouch using a tapestry needle and the blanket stitch. With MC yarn, Ch 43. Repeat Step 3 for 30 more rows (32 rows total). Ch 2 (counts as first hdc), turn, hdc2tog, hdc across to 2nd to last stitch. Continue Step 6, decreasing stitch count by 2 each row until you have only 2 stitches remaining in the row. Turn, Hdc2tog in last 2 stitches, fasten off and weave in ends. Place your crocheted pouch in a mesh laundry bag that is loose and flexible. Using a large plastic tub or large sink, fill halfway with very hot water that is barely tolerable to your touch. Add about a teaspoon of dish washing soap. With the crocheted pouch still in the bag, sandwich it between your hands and begin rubbing it together somewhat vigorously. Do this for several minutes. The agitation of the bag against the crocheted material is what you really need to get a thorough felted look. You don’t have to keep the crocheted pouch submerged as you agitate but make sure you re-wet and warm up the fibers by dunking it every minute or so. Remove the crocheted pouch from the bag and examine for thoroughness of the felting process. If it’s not to your liking, continue with step 6 and add additional hot water to keep the fibers open. One satisfied, rinse the crocheted pouch under cold water, then squeeze out any excess water first between your hands, then by pressing the crocheted pouch between 2 towels. Set out to dry on another towel or throw in your dryer at the hottest heat for extra measure. 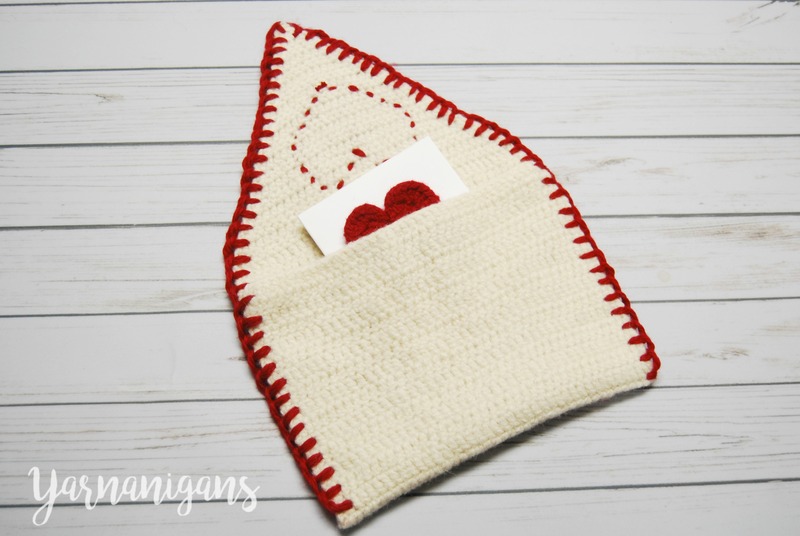 Attach your felted hearts to the pouch using the CC yarn and tapestry needle. Thread your tapestry needle with 60-72″ of CC yarn. Fold the flat side of the pouch over and line up just before the decrease rows. Place pins. Begin blanket stitching about 1/4″ in along the side of the pouch from the folded edge. 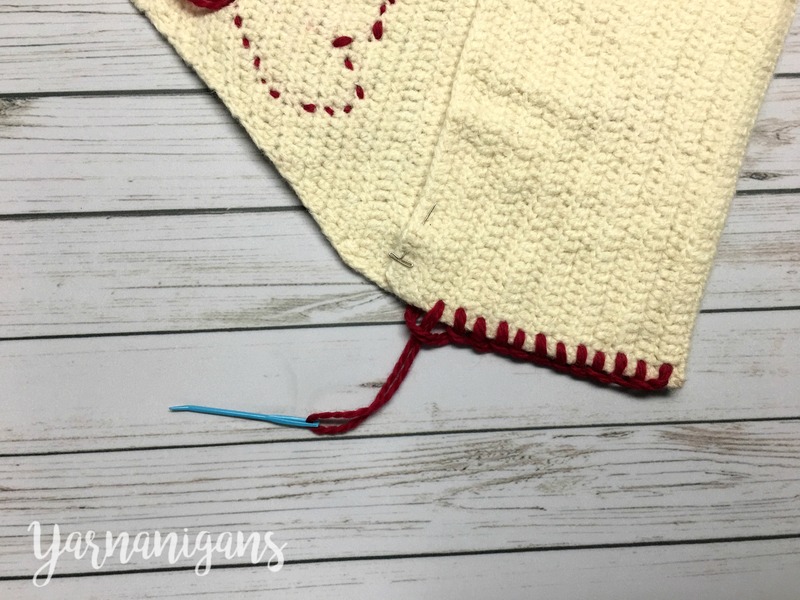 I recommend this video tutorial to follow for how to blanket stitch along a seam. Continue blanket stitching up along the side placing stitches approximately 1/4″ apart, up around the flap, then back down the other side. Cut thread and weave in under blanket stitches or secure by felting with a felting needle. Fold the flap over and voila!